Balanced Scorecard is a system of strategic company management based on measuring its performance with a set of KPIs that reflect all the aspects of the company's activities. As a strategic tool, Balanced Scorecard is characterized by that all the company's actions are connected and have specific indicators that show how the plan is being fulfilled and the goals are being achieved. Goal Map is a structured scheme that shows the result that the company must achieve and what actions must be undertaken in order to do so. 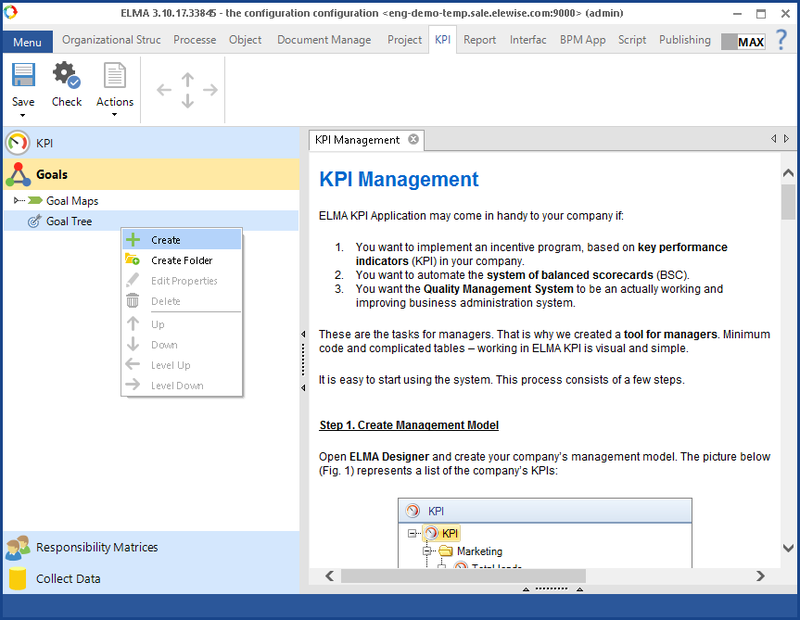 In ELMA, Balanced Scorecard elements are created and configured in ELMA Designer on the KPI tab. 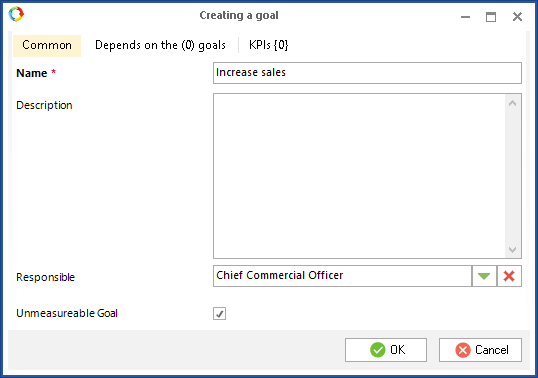 To create a goal, open the KPI tab, select Goals on the left panel, right click on Goal Tree and select Create. Whether the goal is Unmeasurable – if this box is unchecked, then a KPI is defined for this goal. On the Depends on the goals tab, define the goals that affect the achievement of this goal. To add a goal, click Add, select a goal and specify its weight – how much it affects. If the goal is measurable, on the KPIs tab specify the KPIs, on which the goal will depend. You can add existing KPIs or create new. If you select several KPIs, you need to specify the Main KPI. The status of goal achievement will be defined according to the main KPI. 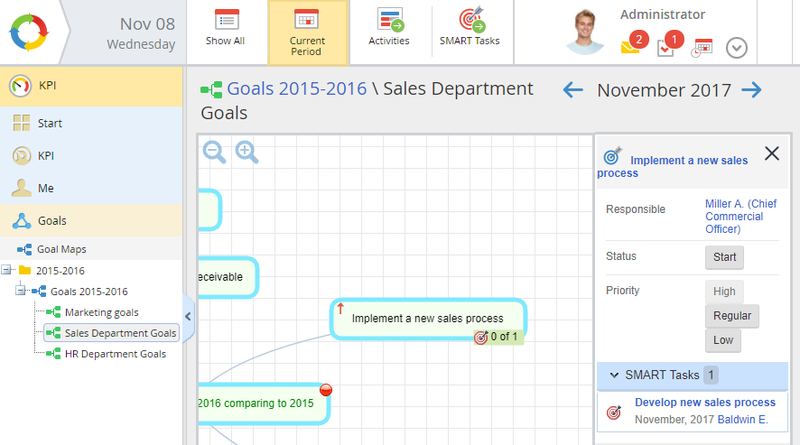 The Goal Maps allow you to connect goals and activities. 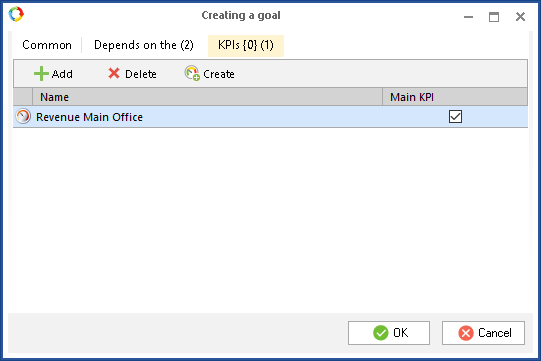 To create a goal map, open the KPI tab, select Goals in the left panel, right click on Goal Maps and select Create. On the Diagram tab, you can create the map itself. 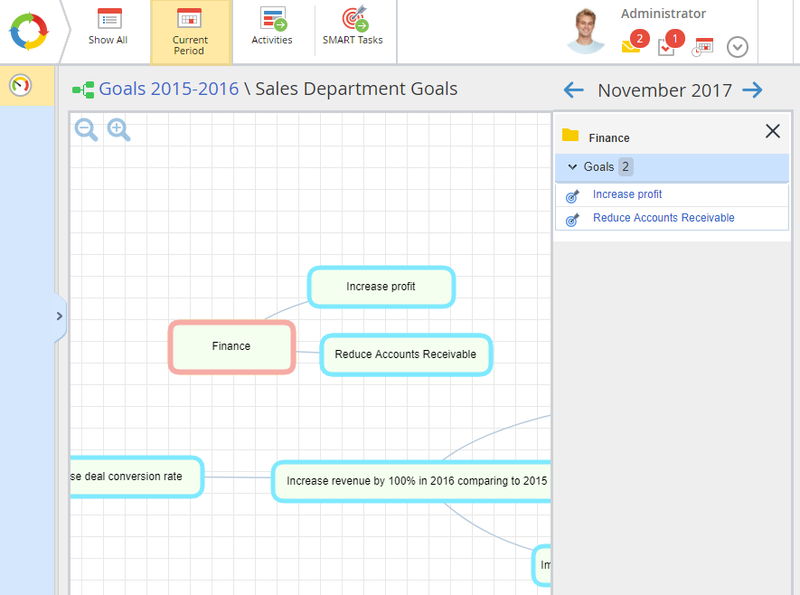 To add goals to the map, you can drag and drop the existing goals from the tree, or right click on the diagram and select Create Goal in the context menu. 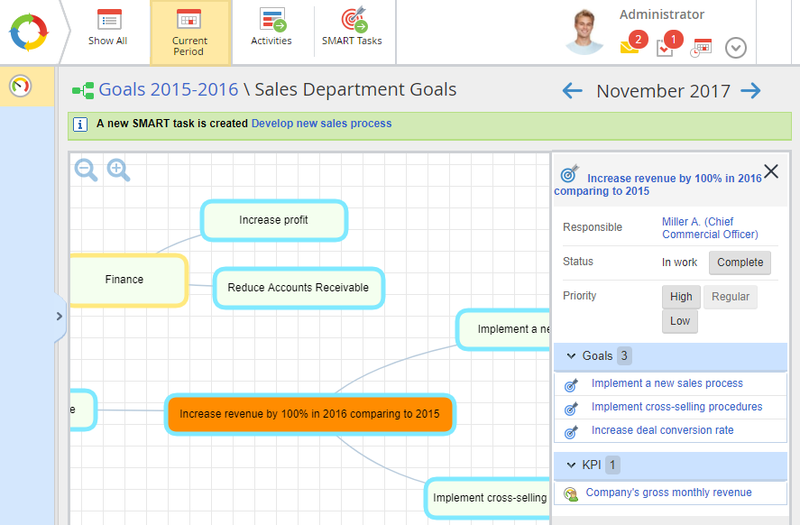 On the Responsibility Matrix tab, you can assign access to the goal map. The Informed user, Supervisor or Responsible user can work with the goal map in Web Application. 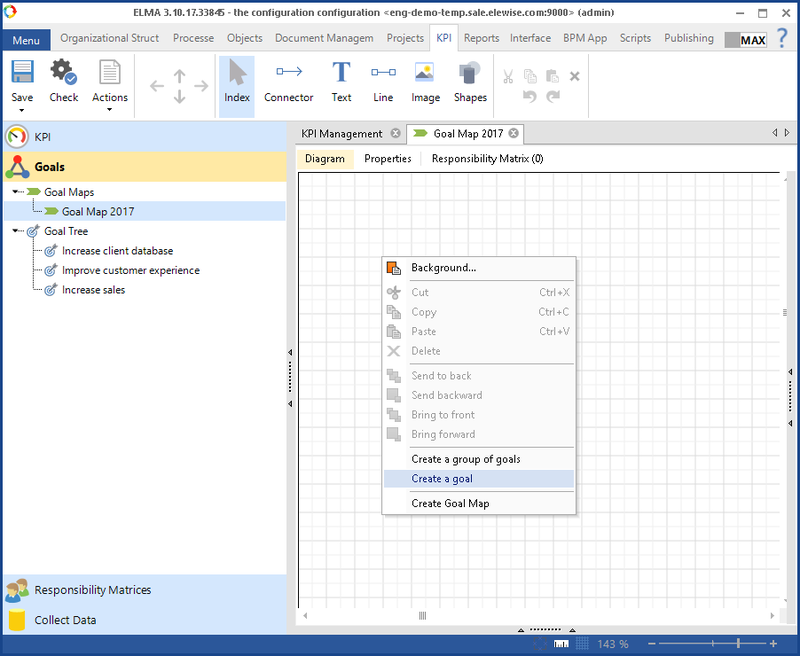 If a goal map is no longer relevant, you can send it to Archive by right-clicking on the map and selecting To Archive. 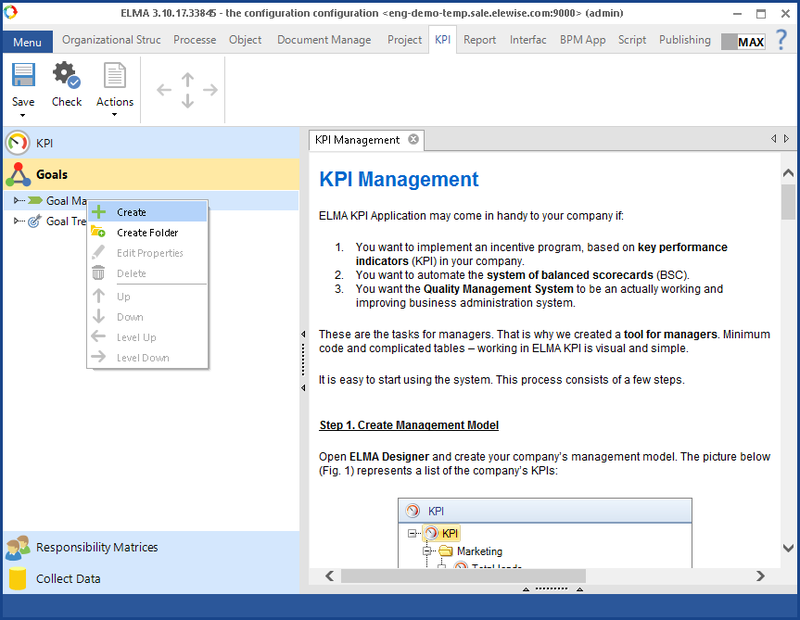 In Web Application, Balanced Scorecard elements are displayed in KPI – Goals. Access to this section is assigned in Administration – Application Access Settings – Global Access Settings – KPI Management – "Goals Management" section access. The Goal Tree section displays all the goals and allows you to open the page of any goal. 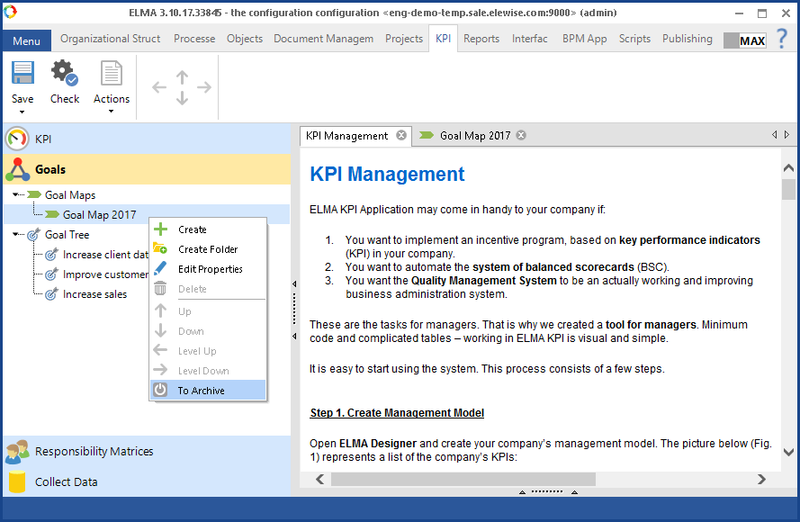 The goal page shows the main information on the goal: responsible user, status, related goals, KPIs, activities and SMART tasks. You can create a SMART task related to the goal, using the Add SMART Task button in the toolbar. Published goal maps are displayed in the Goal Maps section. When you click on a map element, its information panel opens on the right. Goal groups have the yellow border and goals have the blue border. A goal group information panel shows the goals it includes. 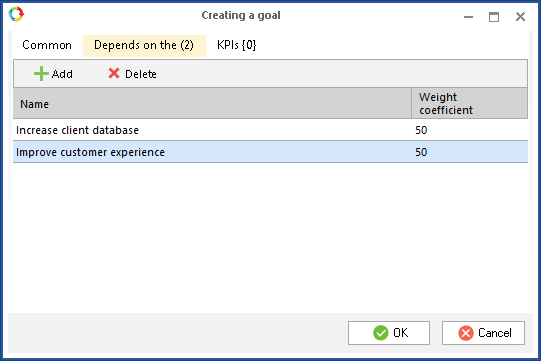 The goal status that depends on the main KPI value is displayed in the lower left corner of the goal shape. 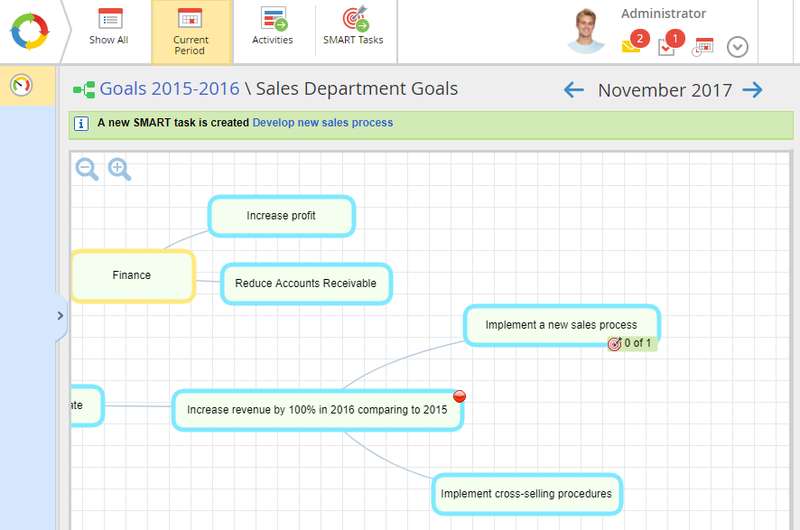 If SMART tasks are added to the goal, the number is displayed in the lower right corner. You can change the goal status on the goal information panel. Goals with the Active status are highlighted with orange and green (after refreshing the page). Completed goals are highlighted green; after refreshing the page, such goals are crossed out. You can specify the priority of a goal. By default, goals have the regular priority. High priority goals are marked with a red arrow icon. To add an activity to a goal, right click on the goal and select Create Activity. In the dialog box, specify a name, planned period and the responsible user. The list of all the created activities is displayed in the Activities section. Currently executed activities are green, completed are crossed out. 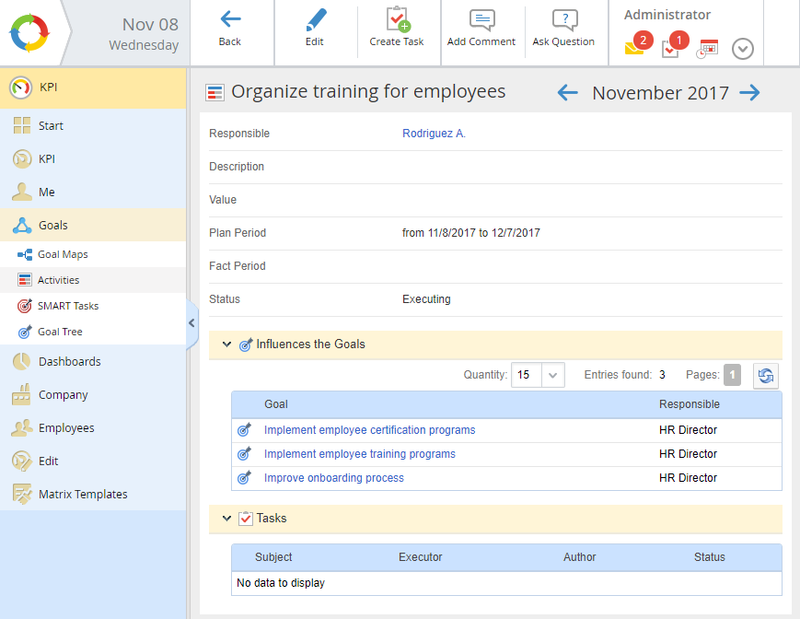 From this section, you can open the page of an activity, which displays the main information about it: responsible user, deadlines, and status. Using the Edit button in the toolbar you can change the name, period, and responsible user.